How do I get a copy of my fire report or ambulance report for my insurance? Download the Freedom of Information Act (FOIA) request form and return it to the Administration Office. They are open Monday-Friday, 8 am-4 pm. Closed on major holidays. How do I know what fire district I live in? Your tax bill will be your first go to for this question. Also, if you live in the Villiage of Channahon in Grundy County, you are a Minooka Fire District resident. What type of classes does the fire district offer? We have scheduled CPR/AED, First Aid, and Babysitting classes. The schedules, descriptions, and cost of the classes can be found on our website under the “Public Education” tab. Can I bring my child/or group to tour the fire station? Yes, we are happy to provide tours based on availability of personnel. It is always helpful if you can call ahead and schedule. For group tours: Please download and fill out the Fire District Event Request form. Once the Fire and Life Safety Educator has received the request, they will contact you to set up your appointment. The tour lasts approximately 30-45 minutes. Can a fire engine come to our block party? Yes. There is a Fire District Event Request Form that accompanies the block party paper work with the Village. We have to limit our visits to one hour. Due to in climate weather or an emergency response, we may have to cancel last minute. Can we have a birthday party at the fire station or have the fire engine come to our house for a birthday party? Sorry, we are unable to host or attend birthday parties; however, you are welcome to schedule a tour for the birthday group and we will do our best to accommodate you. I bought a new swimming pool. Can the fire department fill it? No. We do not provide this service. My son/daughter is in high school and is interested in being a firefighter. Do you have a Cadet program? Yes, if you attend Minooka Community High School, are between 15 and 17 years old and maintain a “C” average in school. Once the application is filled out, bring to the Administration Office at 7901 E. Minooka Rd., Minooka, Il 60442, Monday through Friday, 8am-4pm. How do I become a volunteer firefighter with the Minooka Fire District? 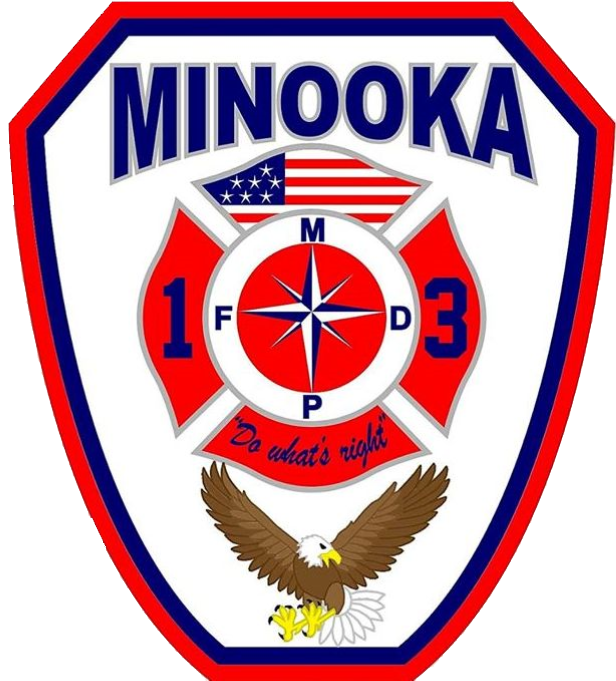 You must be at least 18 years of age, in good physical condition (able to pass a medical physical and physical agility test) and live within the Minooka Fire Protection District. Once you have completed the application stage and passed your physical requirements you will be placed in an orientation program that teaches you all about our operation. Once the application is filled out, bring to the Administration Office at 7901 E. Minooka Rd., Minooka, Il 60442, Monday through Friday, 8am-4pm. How often should smoke alarms and carbon monoxide detectors be replace? It is recommended every 10 years for smoke alarms, 6 years for carbon monoxide detectors, and at least once a year for the batteries in those alarms/detectors. Where can sharps, household chemicals, and expired medications be disposed? For Sharps Disposal: In Illinois, household containers that are puncture‐proof with a tight‐fitting lid, such as plastic detergent bottles, can be used if heavy duty tape is used to secure the lid to the container. Write the words “Do Not Recycle” on the container with a permanent marker and place in the regular garbage bin. Never place the container in the recycle bin. Please refrain from using a clear or glass containers. If you live in Grundy County, Grundy County Coroner’s Office, 1320 Union Street, Morris, IL will take both sharps and medication. For Household Chemical Disposal: To dispose of latex paint, simply let it air dry or mix some absorbent material into it. When dry, set it out for your regular refuse service. You may need to leave the lid off the can to demonstrate to hauler personnel that it is indeed a dry material and not a full, liquid can of paint. To dispose of oil-based paints or other unwanted household chemicals, check with the IEPA at www.epa.state.il.us for a current list of the one-day household hazardous waste collection events in your area. You may also check with the Naperville HHW site located 156 Fort Hill Drive in Naperville (located just north of Public Works at Fort Hill Drive & Jefferson Avenue. The facility is open on Saturday and Sunday from 9 a.m. to 2 p.m. excluding holidays. For more information, call 630-420-6095. For a list of items accepted at this site, lease see page fourteen of the Grundy County Green Guide. For Medication Disposal: We do not accept medication or sharps containers. The medication drop box is meant to collect excess, unwanted or expired pill medications, which helps keep them out of young people’s hands and protects the environment. Both Minooka and Channahon Police Departments have drop boxes in their lobby areas. What fire codes does the Fire Protection District enforce? If in the Village of Channahon, contact the Channahon Building Department. Are there fees for plan reviews? Are fire sprinklers required in all buildings? Sprinklers are required in all new buildings and any existing building that undergoes a “change in use”. For example, if a building was formerly used as an office and someone is planning on using it as a store, that is a change in use that would require sprinklers. Does the fire district offer CPR classes for businesses? Yes, we offer the American Heart Association CPR/AED and First Aid classes. Please contact our Fire & Life Safety Educator for prices and to set up a date/time for your class. 815-467-5637 ext. 112. Does the fire district offer fire extinguisher training? Yes, please contact our Fire & Life Safety Educator for prices and to set up a date/time for your class. 815-467-5637 ext. 112. Is it possible to have a firefighter give a fire safety presentation to our group? Absolutely! Our Fire & Life Safety Educator speaks on various fire safety topics. Please call 815-467-5637, ext 112 for more information. I think there is a potential fire hazard at a building I frequent in Minooka or Channahon. Who can I contact to discuss it? Please contact Fire Inspector Rodney Bradberry at 815-467-5637 ext. 113 with any questions.